Our first Crawl in the vibrant city of San Francisco was a success! The weather was perfect (cool and sunny) and participants loved walking the diverse and colorful SF streets. There was lots of media coverage leading up to and recapping the event. Thanks to the ten participating shops, our awesome sponsors, and the enthusiastic Crawlers for making this Crawl possible! Each shop had a creative presentation that highlighted a different aspect of coffee. On the first and third routes, Contraband had a tasting of a Guatemala, a Kenya, and a Bali. 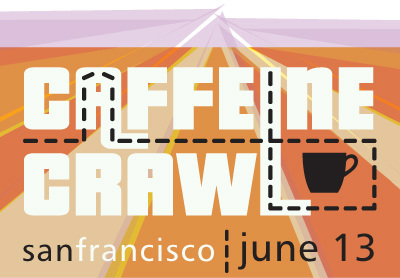 Blue Bottle welcomed Crawlers with a single origin iced coffee featuring St. Benoit Farms milk. Stanza set up a full-on cupping, with instructions in ‘slurp ‘n’ spit’ and discussions of proper temperatures for cupping. Ma’velous wowed Crawlers with a tasting of three coffees from around the country. On routes two and four, Crawlers learned about the science of variables in coffee from Jeremy, founder of Blossom Coffee, Inc., and Devorah from Equator Coffee wowed everyone with her skills on the Stella di Caffe and Unic rep Brian Cornelson did Q&A. In spite of a mix-up on which location would be featured on the Crawl, the folks at Ritual knocked it out of the park with a discussion of sourcing and direct-trade relationships. The stunning walk up Portero Hill ended at Farley’s, a cafe with an historic past. It was a well-rounded taste of the Bay Area coffee community. And on to chocolate. Dandelion and Christopher Elbow both participated, showing two sides of the craft chocolate world. Dandelion, which focuses on small-batch bean-to-bar chocolate, had a tasting tour of chocolate origins, along with a discussion of the path cocoa beans take on their way to our admiring senses. Christopher Elbow went the extra step and engineered collaborations with two coffee shops that were unable to participate in the Crawl, Sightglass and Four Barrel, to create some melt-in-your-mouth coffee ganache with CE’s signature elegant presentation. T-We’s owner Christopher did a wonderful job of conveying his passion for tea to Crawlers, who each got to blend their own teas to take home, while learning about varieties, harvesting, production, blending, and brewing.